GW has forged a partnership with America's first museum of modern art. The Phillips Collection, one of the world's most distinguished collections of impressionist and modern American and European art, has partnered with GW to jointly organize art history courses, artist visits, post-doctoral fellowships, and an internship program. Activities will take place both at GW and the Phillips' Center for the Study of Modern Art. These experiences will enhance learning for students in GW's Columbian College of Arts and Sciences as well as GW's Graduate School of Education and Human Development, which houses the university's Museum Education Program. In November, Phillips Director Dorothy Kosinski and GW President Steven Knapp signed a memorandum of understanding at the Phillips detailing the agreement between the two institutions for the next three years. The first collaboration is a course titled "The Performative Impulse in American Art," taught by GW professor Virginia B. Spivey. The two institutions will also co-sponsor a "Conversations with Artists" series. The first installment features several artists, including John Simon Jr., Jim Sanborn, and Alice Aycock, as they explore the theme "Systems of Knowledge." The artists also will visit the GW campus, where they will interact with students and the faculty. "Faculty members across the department recognize the importance of having students in front of actual works of art, in addition to viewing projected images in a lecture hall," says Dean Kessmann, chair of GW's Department of Fine Arts and Art History in the Columbian College of Arts and Sciences. "We often tell incoming students that we view the local museums as extensions of our classrooms; it is one of the huge benefits of studying art at an urban campus in Washington, D.C."
Emilie Kretschmar, MA '09, worked as a museum supervisor at the Phillips before she began her coursework in art history at GW, and says the opportunity added depth to her educational experience. "As any art historian will tell you, it is absolutely essential to experience and connect with art in person," says Ms. Kretschmar, who now works at the Historical Society of Pennsylvania. "Not every institution of higher education is fortunate to have such a wonderful collection within walking distance, and I think this is a real opportunity for GW students to get inspired, make deeper connections between art theory and art itself, and learn from real working museum professionals." Michael R. Bloomberg, mayor of New York City, will address George Washington University graduates at commencement this spring on the National Mall. Mayor Bloomberg will speak to an estimated 25,000 graduates and guests and receive an honorary degree on May 15. 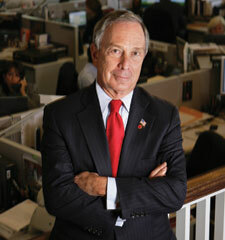 Mayor Bloomberg has achieved world prominence as a civic, business, and philanthropic leader. He was elected in 2002 and has served as mayor of New York City for the past nine years. In 1981, Mayor Bloomberg founded Bloomberg LP, which today provides financial news services to more than 285,000 subscribers in 161 countries. Mayor Bloomberg earned a Bachelor of Science from Johns Hopkins University and his MBA from Harvard University. Previous GW Commencement speakers include first lady Michelle Obama; Rahm Emanuel, former chief of staff to President Barack Obama; former President George H.W. Bush and former first lady Barbara Bush; and Secretary of State Hillary Clinton. A new building for the GW School of Public Health and Health Services is slated for construction on Washington Circle at K Street, 24th Street, and New Hampshire Avenue. Pending zoning approval, GW expects to begin construction next year on the future home of its School of Public Health and Health Services. Located on Washington Circle at K Street, 24th Street, and New Hampshire Avenue, the building will feature more than 115,000 square feet of gross floor area for state-of-the-art classroom facilities, research labs, departmental and office space, and conference rooms at a projected cost of $75 million. The school and its 1,500 students are currently spread out across eight locations, only one of which is on campus. Other building features will include an auditorium, student lounge, study areas, exercise rooms, and specialty spaces specific to the teaching and research activities of GW's Department of Exercise Science. The facility will serve as a central location for research in public health and collaboration between SPHHS and government and non-governmental organizations. Current plans call for the building to be constructed with a range of sustainable materials, and the project will target a minimum of Silver certification under the Leadership in Energy and Environmental Design Green Building Rating System. Nobel Prize winner in medicine Ferid Murad is joining the GW faculty in April. In January, Nobel laureate Ferid Murad visited campus to announce his plans to join the GW faculty in the spring. At the same time, he outlined an ambitious agenda for his time at the university—including grooming future Nobel Prize winners. In 1998, Dr. Murad and two other researchers shared the Nobel Prize in medicine for their work elucidating the role of nitric oxide in the cardiovascular system, where as a gas it aids communication between cells. The knowledge derived from his work has been "critical to understanding numerous diseases and conditions, including hypertension, diabetes, arthritis, septic shock, cancer, gastrointestinal disorders, and neuropsychiatric disorders, to name a few," according to Jeffrey Akman, interim dean of GW's School of Medicine and Health Sciences and vice provost for health affairs. Dr. Murad will begin work at the university in April, assuming the title of university professor—GW's highest academic rank—within the Department of Biochemistry and Molecular Biology in the School of Medicine and Health Sciences. Dr. Murad comes to George Washington from the University of Texas Health Science Center at Houston, where he held several titles, including director emeritus of the Brown Foundation Institute of Molecular Medicine for the Prevention of Human Diseases. 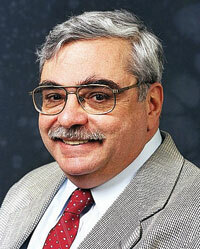 Stay tuned for the spring edition of GW Magazine, which will feature Dr. Murad and his work. A. James Clark, CEO of Clark Enterprises and a GW trustee emeritus, has established the A. James Clark Engineering Scholars program through an $8 million gift. A gift of $8 million from entrepreneur A. James Clark has established a new scholarship program for top undergraduate engineering students. The A. James Clark Engineering Scholars program, open to current or incoming freshmen, will be housed in GW's School of Engineering and Applied Science. Recipients will be chosen on the basis of merit and upon the recommendation of the SEAS dean and a selection board of alumni, practicing engineers, and faculty. The first five Clark Engineering Scholars will be selected by July. Five new scholars will be picked each year, and in 2014, there will be a full group of 20 Clark Scholars at the university. Participants will be awarded an annual merit-based scholarship, renewed each year based on academic standing. They also will participate in an engineering "boot camp" led by SEAS alumni and have opportunities for summer internships and to study abroad. "Clark Construction and GW have enjoyed a long and mutually beneficial relationship," says Mr. Clark, board chairman and CEO of Clark Enterprises Inc., the parent holding company of Clark Construction Group LLC. "We have built many buildings together and our company has hired, and continues to employ, many fine GW graduates." For the Clark Engineering Scholars, he says, the combination of the new program and a GW education "will provide an excellent foundation for a lifetime of opportunity, enjoyment, and contributions to society." 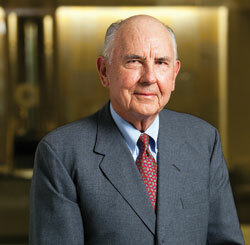 Mr. Clark, a trustee emeritus at GW, received an honorary doctorate of engineering from the university last year. President Steven Knapp—along with College of Professional Studies Dean Kathleen Burke, School of Nursing Dean Jean Johnson, and Craig Linebaugh, associate vice president for academic planning and chief academic operating officer of the Virginia Science and Technology Campus—visited the Virgnia Senate and House in Richmond Jan. 20 to urge lawmakers to keep incentive programs and research opportunities open to private universities. With the Loudoun County-based Virginia Science and Technology Campus and multiple graduate education centers in Alexandria and Arlington, as well as the Hampton Roads Center in Newport, GW administrators supported a new bill by Virginia Gov. 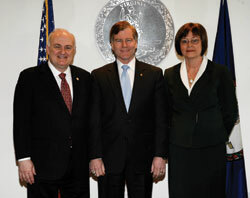 Bob McDonnell (R), which proposes to help 100,000 more Virginians earn degrees over the next 15 years. The Virginia Science and Technology Campus, home to GW's new School of Nursing, is celebrating its 20th anniversary this year. After meeting with about two dozen lawmakers, the GW administrators visited the state Capitol and were introduced in the Virginia Senate and House chambers' upper level. GW student volunteers paint a mural on a wall of Ballou Senior High School in D.C. Ballou displays logos from a variety of colleges and universities as inspiration for its students. GW community members were at the school Jan. 18 as part of George Washington's annual Martin Luther King Jr, day of service, during which more than 500 GW volunteers helped to spruce up five public schools in Southeast D.C. Volunteers painted playgrounds and walls, created murals, organized classrooms, and cleaned desks. Users of Apple's iPhone can now access campus maps, course information, and a university directory through a free mobile app created by GW Academic Technologies with involvement from several students. 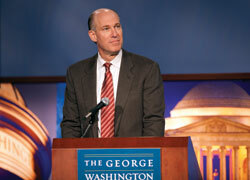 The app, GW Mobile, debuted earlier this academic year and is available on iTunes. GW is one of only a few schools nationwide that have tapped student talent to create its own application, according to P.B. Garrett, assistant vice president and deputy chief information officer for academic technology. Along with class information and maps, the app includes links on athletics, on emergencies, and on RSS feeds from GW Today and The Hatchet. Academic Technologies also has started developing a Droid version, Ms. Garrett says. Jeffrey S. Akman, chair of the Department of Psychiatry and Behavioral Sciences, is serving as interim dean of the School of Medicine and Health Sciences and vice provost for health affairs until permanent leadership is identified through a nationwide search. A review is underway of the George Washington University Medical Center at the request of the Medical Center Committee of the Board of Trustees. The request was motivated by several factors: the approaching 10th anniversary of the creation of the center's current structure, the changing conditions of the health care marketplace as a result of local competition and health care reform legislation, and the university's commitment to continue raising the center's academic stature. "The focus of this plan is on the future," President Steven Knapp says. "We're looking into how we can position the Medical Center and all its programs to achieve the greatest possible success for the future." The first phase of the review has concluded. During this first phase, the university engaged a team of experts from BDC Advisors to perform an organizational assessment, with a focus on the current structural relationship between the center and the School of Medicine and Health Sciences. In its phase one summary report, BDC Advisors emphasized that while the Medical Center and its partners "performed well over the past decade, fundamental changes in the health care economy and local market are changing the competitive landscape." In the future, the report said, "health system success will be based less on reputation and volume and more on integration of care and effectively delivering better quality and more efficient care." Three specific recommendations by BDC Advisors from phase one are to change the reporting structure so that the deans of SMHS, the School of Public Health and Health Services, and the School of Nursing report directly to the GW provost; to eliminate the vice provost/vice president for health affairs as a separate need; and to strengthen the dean of SMHS' role by giving him or her responsibility for the school's educational and research activities as well as its relationships with its clinical partners. BDC Advisors stated that this restructuring would better position the Medical Center to meet current and future needs. It also noted that "there is a need to clarify the vision, strategy, and financial plan, including philanthropy," shared by the university, George Washington University Hospital, and Medical Faculty Associates. The university is now in the second phase of the review, in which faculty members and other stakeholders are engaged in planning for the Medical Center's future structure, vision, and strategy. Town hall meetings have been held with Medical Center students, faculty, and staff to outline the review process, and intensive outreach will be conducted to solicit feedback. At the request of Dr. Knapp, Provost and Executive Vice President for Academic Affairs Steven Lerman has formed an advisory committee to facilitate the phase two review process, which is expected to be completed by the end of the spring semester. Dr. Knapp and Dr. Lerman also announced new interim leadership for the Medical Center, which will guide the Medical Center through the second phase of the review. Jeffrey S. Akman, chair of the Department of Psychiatry and Behavioral Sciences, is serving as interim dean of the School of Medicine and Health Sciences and vice provost for health affairs until permanent leadership is identified through a nationwide search. Vincent A. Chiappinelli, the Ralph E. Loewy Professor and chair of the Department of Pharmacology and Physiology, is now interim associate dean of the SMHS and associate vice provost for health affairs. Dr. Akman, MD '81, a SMHS faculty member for 25 years, has chaired the Department of Psychiatry and Behavioral Sciences for the past 10 years. He has led more than 300 faculty members, overseen the department's clinical practice of general adult psychiatry, and served as chief of the psychiatry service of the GW Hospital. Dr. Chiappinelli has received international recognition for his research on nicotine and its effects on synaptic transmission in the brain. The National Institutes of Health has funded his research for more than two decades. Former Minnesota governor and potential 2012 presidential contender Tim Pawlenty outlined his vision for the nation and signed books at the GW Republicans-sponsored event "Pizza with Pawlenty" Jan. 13 at GW's Marvin Center. 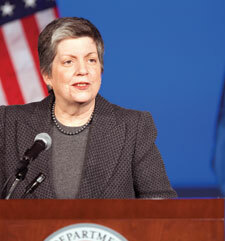 Secretary of Homeland Security Janet Napolitano announced the replacement of the current color-coded alert system during a speech at the Jack Morton Auditorium Jan. 27. 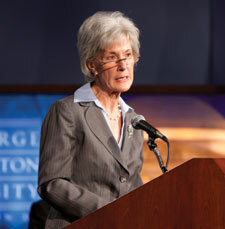 Department of Health and Human Services Secretary Kathleen Sebelius announced the new 2010 Dietary Guidelines for Americans along with Secretary of Agriculture Tom Vilsack Jan. 31 at GW. Both secretaries also visited GW this past fall: Secretary Sebelius unveiled a new tobacco control strategy Nov. 10, and Secretary Vilsack, with Secretary of Energy Steven Chu, spoke at the GreenGov Symposium in October. U.S. 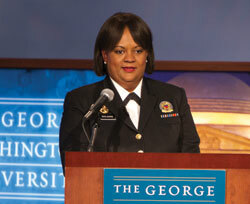 Surgeon General Regina Benjamin advocated for increased support of breast-feeding at GW's Jack Morton Auditorium Jan. 20. 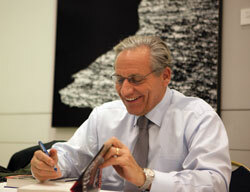 Journalist Bob Woodward discussed his new book Obama's Wars and signed books Nov. 30 at GW's Elliott School of International Affairs. PBS host Tavis Smiley moderated a panel discussion at Lisner Auditorium Jan. 13 addressing how America can improve its future. Panelists included Arianna Huffington, Dr. Cornel West, and Dana Milbank, among others. The dialogue was broadcast live on C-SPAN and rebroadcast on Mr. Smiley's PBS talk show. Four former White House press secretaries shared some of their biggest challenges—and some of their most embarrassing moments—with GW's School of Media and Public Affairs Director Frank Sesno and a full house in Lisner Auditorium Feb. 7. The event featured Mike McCurry and Dee Dee Myers, who served under President Bill Clinton, and Dana Perino and Ari Fleischer, who served under President George W. Bush. 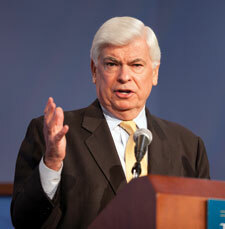 Former Sen. Chris Dodd (pictured) and Hon. Gary Gensler, chairman of the U.S. Commodity Futures Trading Commission, anchored a high-powered lineup of speakers and panelists Jan. 14 at a financial regulatory reform symposium focusing on the impact of the historic Dodd-Frank Act. Nearly 250 participants filled the Jack Morton Auditorium for the event, co-sponsored by GW's Center for Law, Economics & Finance and Center for Real Estate and Urban Analysis. Former Democratic National Committee Chair Howard Dean (left) and former Speaker of the House Newt Gingrich (right) faced off in a College Democrats- and College Republicans-sponsored debate Feb. 1 at George Washington's Lisner Auditorium. The debate was moderated by Derek Malone-France (center), interim executive director of the University Writing Program and director of Writing in the Disciplines. 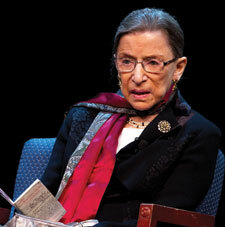 Supreme Court Justice Ruth Bader Ginsburg spoke with NPR legal affairs correspondent Nina Totenberg at Lisner Auditorium Feb. 4 for a Smithsonian Resident Associates Program event. The court's second female justice shared details of her life, her marriage of 56 years, and her experiences on the nation's highest court. 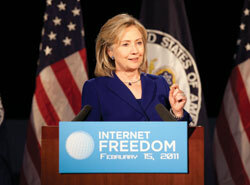 Secretary of State Hillary Rodham Clinton urged countries around the world to support the United States in promoting open access to the Internet during a speech Feb. 15 at GW. 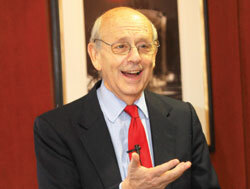 Supreme Court Justice Stephen Breyer discussed his seminal 1970 article on copyright at a Nov. 4 GW Law School symposium. 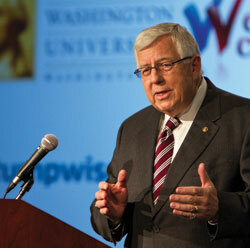 Sen. Mike Enzi, BBA '66 (R-Wyo., pictured), and Beau Biden, Delaware attorney general and son of U.S. Vice President Joe Biden, shared tips for effective campaign strategies for veterans seeking elected office at the GW Veterans Campaign "boot camp" Feb. 11-12. GW was one of 14 schools added this year to a prestigious list of universities with "very high research activity." The change appears in the 2010 update to the Carnegie Classifications of Institutions of Higher Education, released this January by the independent Carnegie Foundation for the Advancement of Teaching. A three-tiered research university category—led by the "very high research activity" label—in 2005 replaced the well-known categories "Research I & II." The upper-most tier now lists 108 top research institutions. "Our status has changed," says GW Vice President for Research Leo Chalupa. "It's clear that the word has gone out that our aspirations are to be a premier research institution, and we have attracted some substantial grants that have made the news. Those call attention to our status." Engineering professor Rahul Simha has been selected as the District's Professor of the Year by the Council for Advancement and Support of Education and the Carnegie Foundation for the Advancement of Teaching. Each year since 1981, CASE and the Carnegie Foundation for the Advancement of Teaching have recognized four national winners and individual state winners as Professors of the Year. The award is the only national award that recognizes excellence in undergraduate teaching and mentoring. Dr. Simha, a professor in the Department of Computer Science within the School of Engineering and Applied Science, came to GW as a visiting professor in 1998 on a sabbatical from the College of William and Mary. When his sabbatical ended, he decided to stay at GW. 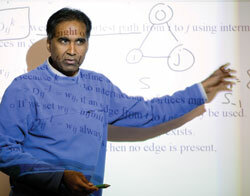 In addition to teaching several classes each semester, Dr. Simha has helped to revamp and diversify the computer science undergraduate curriculum. Barry R. Chiswick, a renowned economist who served on the President's Council of Economic Advisers under President Gerald Ford, is the new chair of GW's Department of Economics. Dr. Chiswick served as a distinguished professor and founding director of the University of Illinois at Chicago Center for Economic Education. In December, 17 nurses made GW history by becoming the first undergraduate class to graduate from the university's School of Nursing. The school honored its newest graduates with a baccalaureate pinning ceremony—a traditional rite of passage in nursing—on GW's Virginia Science and Technology Campus in Ashburn. GW's newest exchange program will send students to the other side of the globe. In January, GW President Steven Knapp and Ian Chubb, president and vice chancellor of Australian National University, signed a letter of intent to begin planning a student exchange agreement between the two universities. The proposed partnership would allow indigenous Australian students to come to the District to participate in GW's Semester in Washington Politics Program and Native American Political Leadership Program, as well as seek ways to send a Native American student to Australia. GW's Graduate School of Education and Human Development has received $3.7 million in funding to support bilingual special education training for D.C. Public School educators and fund tuition costs for students in rehabilitation counseling and job development programs. The money will provide financial support for up to 92 graduate students. Some of the award went to the Department of Special Education and Disability Studies for the training of 20 DCPS educators to work with culturally, linguistically, and socio-economically diverse students. Funds will also support the creation of an interdisciplinary curriculum to aid in teacher preparation. The Department of Counseling and Human Development also received part of the award for tuition support for three of its degree programs: the master's program in rehabilitation counseling, the graduate certificate in job development and placement, and the online graduate certificate in forensic rehabilitation counseling. This year marks the third year in a row that George Washington has earned the top spot in the rankings of colleges and universities with the most alumni in the Peace Corps among medium-sized schools. The university currently has 72 undergraduate alumni serving overseas. The university is interested in hearing from alumni who have served or are currently serving in the Peace Corps as it plans for the Peace Corps' 50th anniversary and related celebration events. Please contact GW via e-mail at peacecorps@gwu.edu.